So many businesses claim to be ‘customer-centric’ or ‘customer first’, putting customer experience first. Including us! It’s not often that we get the chance to ponder what that really means. And it’s only once a year that we get to spend two whole days building a better understanding of it. We’re going to try and summarise what we saw and what we learnt in…. Much less than two days. Legendary campaigns aren’t easy to replicate. But they make excellent learning material – even better inspiration material. There was no shortage of legendary campaigns on display and being dissected at this year’s forum. After gathering them onto our invisible mental Pinterest board of ideas, we started to notice a trend. The lesson? Don’t be scared. Be bold, take risks. That’s when people will realise your brand is human. We watched Lara Thom of Guzman y Gomez discuss their #BringCalHome campaign in which they responded to a cheeky Facebook comment and, in the process, showcased their sense of fun. 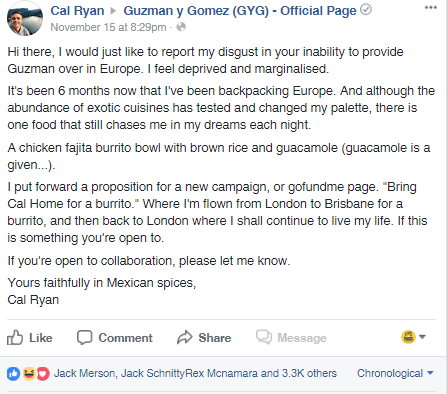 An Aussie backpacker, Cal Ryan, complained on their Facebook page that about the lack of Guzman y Gomez restaurants in Europe. On a public post on their page, he told them felt “deprived and marginalised” by his lack of access to their high-quality burrito bowls. They could have ignored him. But they ran with it. They declared that all Cal needed was 3000 comments and 1000 likes and they’d bring him home. And they did bring him home, just in time for him to attend the opening of their 100th restaurant. Which, incidentally, is one of their top-performing retailers to this day. Customers don’t care about the technology you’re employing. It doesn’t really matter to them if you’re delivering your service via AI-powered superbots, drones, or blockchain-powered rollerskis. It’s that they get what they needed, that it was convenient, enjoyable, delivered fuss-free, conformed to their expectations or exceeded them. People don’t care about Alexa’s 45,000 skills unless they’re directly improving their lives. It was a theme that ran through the veins of the forum. But that doesn’t mean the speakers were advocating for a return to the good ol’ face-to-face. Far from it. We all became students in the school of solving human crises with human technology. The perfect example came from the former president of Estonia, Taavi Rõivas. In his spellbinding address, we saw how digital CX principles can improve a whole country’s quality of life. And, using technology like Estonia’s e-ambulance app, saves lives. Bringing voting, tax-returns, medical prescriptions, and 600-or-so other essential services online made Estonia the world’s most advanced digital society. 3. Our brains don’t always… do the thinking. Brains are both head and heart. It would be nice to think that we (and our customers) are rational beings. But it’s smarter to realise that we simply aren’t.Arron Child gave us a crash course in Neuromarketing and the reasons why you now know (and probably use) Airtasker. Professor Melissa Casey, Head of Psychology at Monash Health, talked us through the science behind cognitive errors and how we’re all making them. But the overall sentiment was this: the brain might be irrational, but that doesn’t mean we can’t understand it. In fact, the final act of the exceptional showcase that was ADMA’s Global Forum was proof of just how far our understanding of the brain has come. Far enough that we can replicate it and bring it to life with robotics that the human race can be proud of. 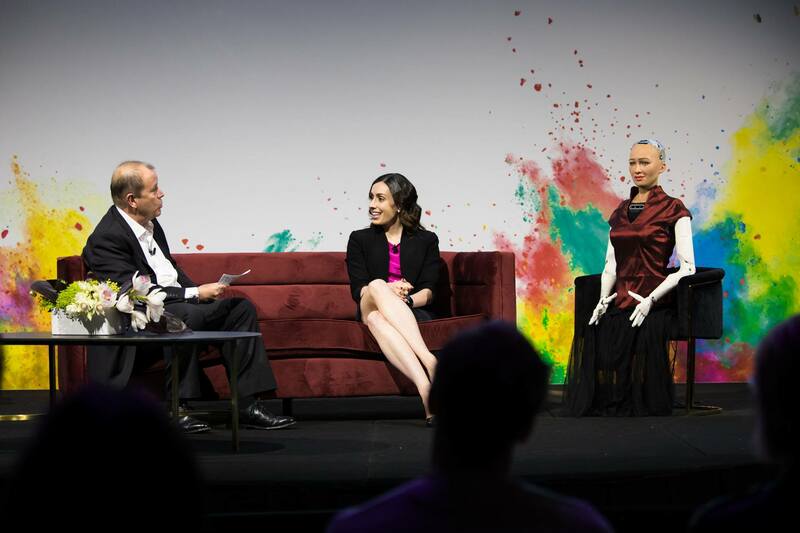 Closing the two-day learning spree was Sophia the humanoid robot, citizen of Saudi Arabia… Seeing her interviewed was an experience we’re not going to forget in a hurry! Bravery, buzzwords, and brains aside, there were many exciting and meaningful conversations we had with other attendees. You might have noticed our data arm, Pivot Insight, at our stall and coffee cart. Pivot Insight is here to help you find out things about your consumers that they don’t even know themselves. We use consumer discretionary spend data to power up your strategy. So, if you’d like to PICK UP some consumer data you can actually use, we’ll PICK UP the coffee. Get in touch! Click here to learn more about Pivot Insight.